The art work I made is the miniature size of a music box that is used as a case for musical instruments. This music box includes my own calligraphy input which is inspired by Islamic art. The dimensions of the music box I made are 21 cm by 30 cm, however, the real life size of the music box that I used as a model measures 3 meters by 1.5 meters. I made this music box from wood which has a bright brown color. The main reason that I chose calligraphy to design my music box with, is that it constitutes one of the most popular types of Islamic arts and I appreciate its dynamic and spiritual/religious symbolism found in the Qur'an and important texts in the Islamic tradition. You might ask what the relationship between music and Islam is, and to answer that I should say that music plays an important role in Sufism. Sufi's music mainly consists of instruments like Daf, Tar, Santoor, and etc. 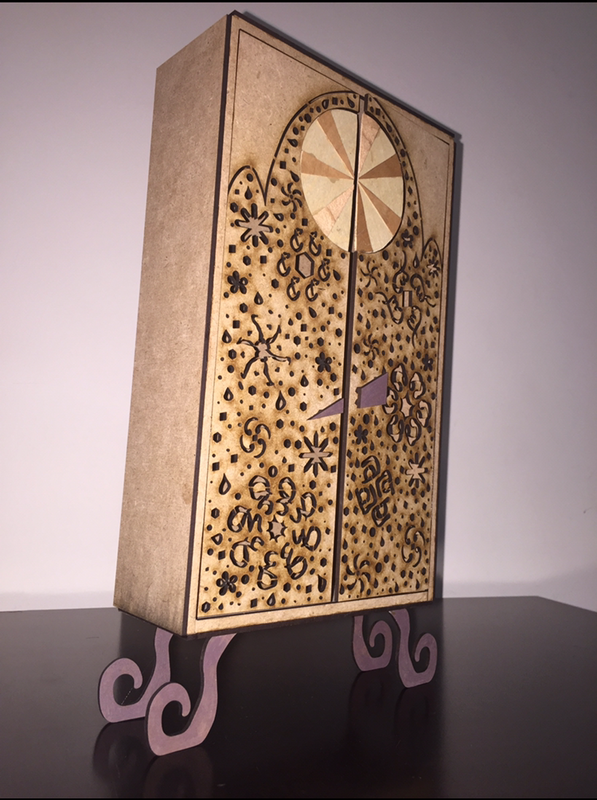 The real life size of the music box I made is used to keep and store musical instruments, and the ones that are used by Sufis have similar designs. My goal is to deconstruct misconceptions about Islam and in particular the following one: 'Art, such as music, is forbidden in Islam'. Paniz Amini: I am an Iranian student in Interior Design and this is my third year in Dubai. Interests: arts, including sketching.